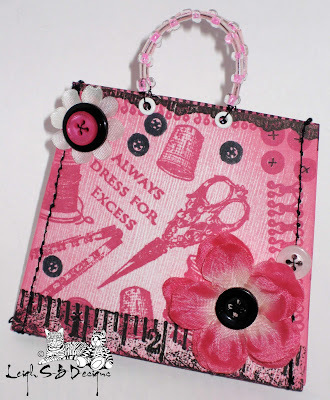 Velvet Paw Creations: Mini Handbag Sewing Kit - A Blockheads Design Team Tutorial! 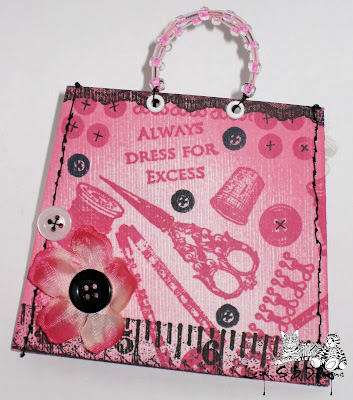 Mini Handbag Sewing Kit - A Blockheads Design Team Tutorial! I've designed a seriously cute mini Handbag Sewing Kit that is oh so pretty in shades of pink and black that's perfect as a two-in-one novelty greeting card and gift or as a nifty little stocking stuffer. I created the handbag template and it can easily be adjusted to make any size handbag but I love miniatures so went with a mini handbag for this tutorial! 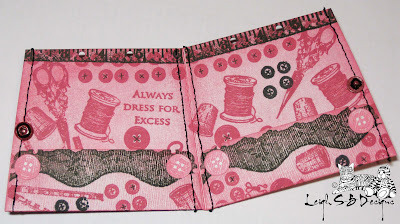 Today I'm featuring a selection of images from their awesome exclusive Sewing themed stamps! Household Notions, Vintage Light Form and one of Blockheads newest releases, the Sewing ATC set! Click on the text or pix below for more info! 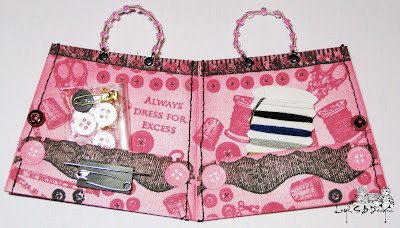 Cut out the handbag template from white cardstock with a deep grain texture to it that kind of reminds me of corduroy for an instant faux fabric effect. 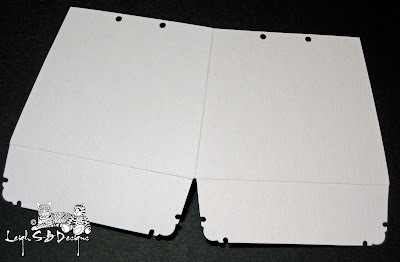 Score and fold along the dotted lines and punch out the holes along the top edge with a small hole punch. I used a fancy corner punch on the two bottom flaps. 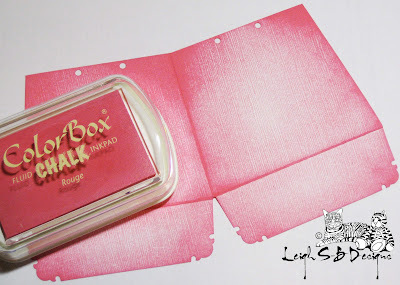 Stain the cardstock with Rouge ColorBox Fluid Chalks ink. I applied the ink with a Inkssentials Ink Blending Tool and Foam (look in the Other Brushes section) but a piece of scrunched up paper towel will do the trick too. 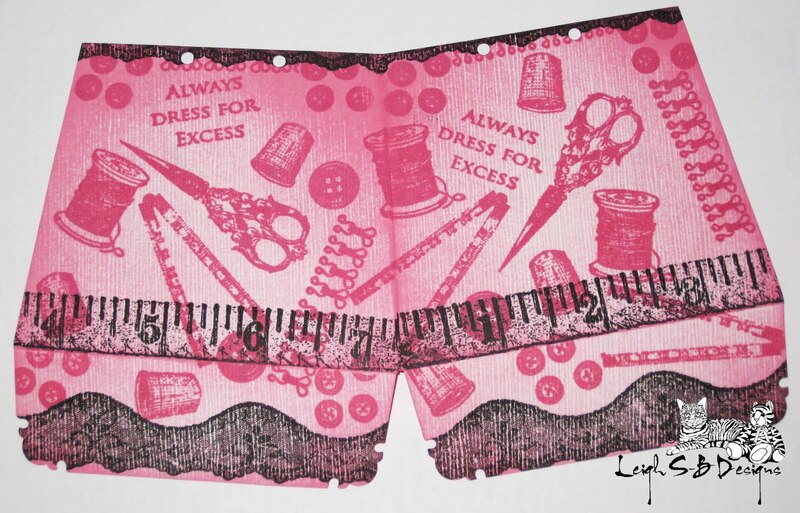 Stamp all the sewing themed imagery with Warm Violet ColorBox Fluid Chalks ink first and then stamp the lace and tape measure images with Versafine Onyx Black ink. 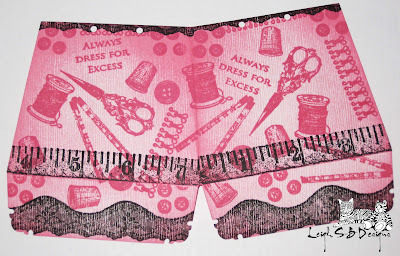 I stamped just a small portion of the lace image along the top edge too. 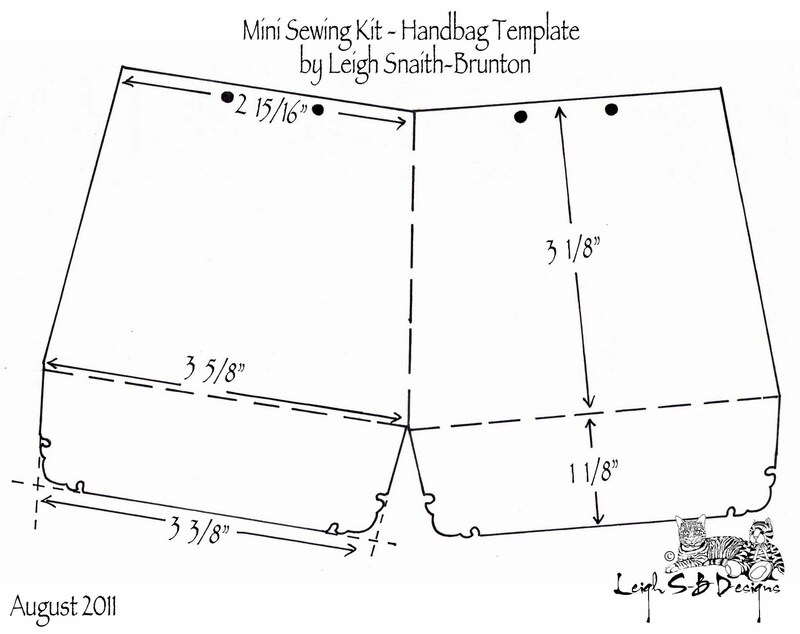 Fold the bottom flaps up and sew along the inside and outer edges of the kit to make the inside pockets. Stamp the small collection of buttons in black Versafine ink on the inside and on the cover of the kit. Stamp four of the large buttons (from the stamp and scissor image) in Rouge Fluid Chalks ink on a piece of scrap cardstock and cut out. 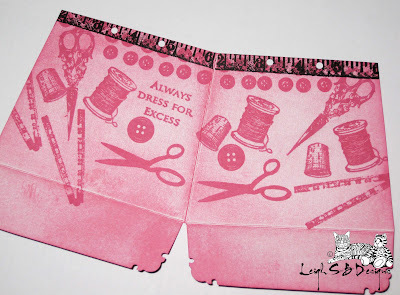 Adhere them to the corners of the inside pockets with a permanent adhesive. 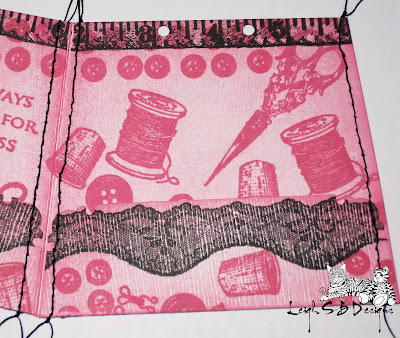 Sew real hot pink snaps to the inside of the kit with black cotton for a closure, I also added a dab of glue to help make the closure more secure. I also drew in faux cotton lines with a black Sharpie on all the pink buttons except for the 4 large ones and one or two of the small ones. Click on the above photo for a closer look at the details. 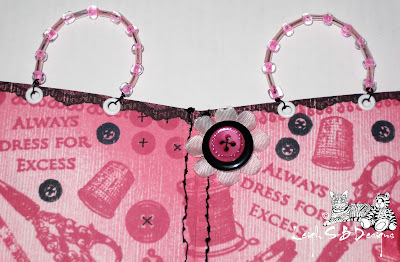 Embellish the outside cover of the kit with fabric flowers and buttons. 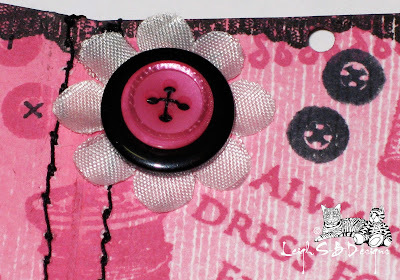 Here's some close ups of the flowers with the buttons I sewed to the centers. I stacked two buttons on the flower in the top photo. 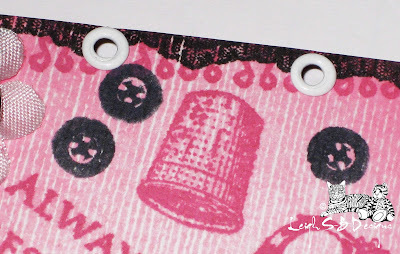 Add mini white eyelets to the holes and attach them with a Crop-A-Dile or other eyelet setting tools. I made the handles for the handbag out of black wire and pink beads. Cut 2 lengths of wire and thread one end through an eyelet and wire wrap it in place. Alternate the beads as you thread them onto the wire and finish by looping the wire through the other eyelet and wrap that end too. Then do the same for the other handle. Cut a small piece of self-adhesive magnet tape and adhere it to one of the pockets. The magnet strip is perfect for storing needles, pins and safety pins. 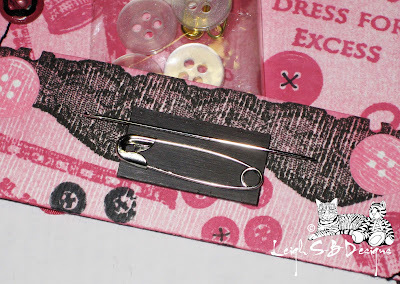 Finish off by tucking in some thread and a mini packet of buttons and whatever else you'd like to add to your kit. 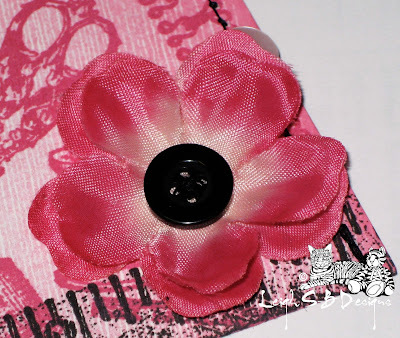 If you're giving it as a card or a gift you could make a matching gift tag and attach it to the handle! I hope you enjoyed my Blockheads tutorial! Don't forget to check out what Karen is up to over at Dreaming and Creating for more Blockheads inspiration! TOooooo darned adorable! Very clever little gift. This is so sweet Leigh! I really love how this turned out. Thank you so much for the tutorial and the template! 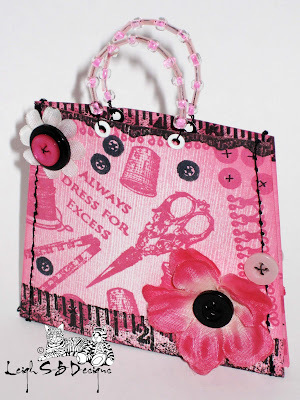 Adorable mini bag and very creative. Thanks for the template and tutorial. 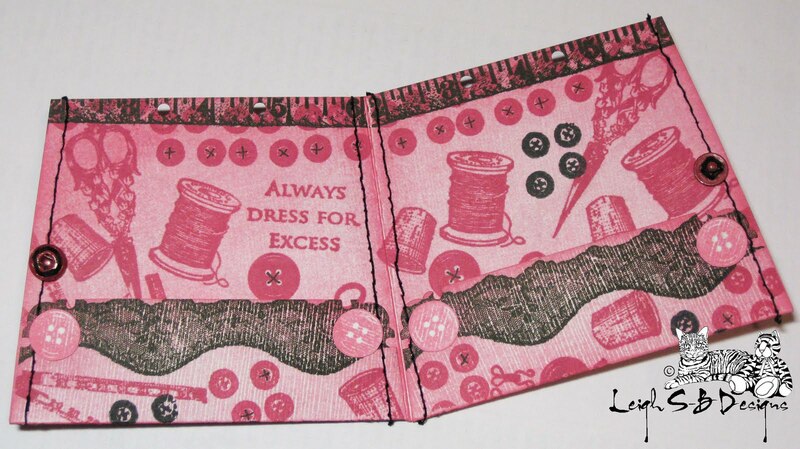 Love all the sewing themed stamps all together. Great template!! I LOve this to pieces!